I decided to highlight epee in this film not only because I fence epee, but because I feel like it is considered the slow weapon in fencing. One of the reasons epee fencers take their time during bouts is because they are constantly defending their whole body while trying to hit their opponent’s entire body. The head, the toe, the hand, the torso…every part of the body is legal target. The play between defending and attacking the whole body as the target creates a wonderfully intricate game of space and distance. For the other two weapons, foil and sabre, their target is limited and the referee has everything to do with the validity of touches. 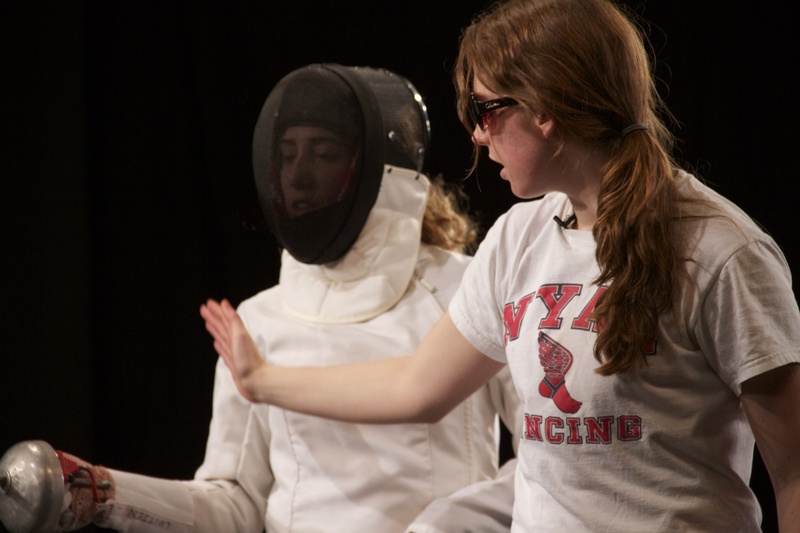 In epee, the referee is secondary and either fencer can score without having right-of-way. Some of the most creative actions come from this non-confining weapon. Epee is not a slow weapon but a tactful and improvised weapon relying on reaction time and speed. Another reason I wanted to show epee in slow motion was to relate back to the televised events of the 2008 Olympic Games. There, slow motion replay was used in between touches for the broadcast audience. This made fencing appear more spectator friendly and easier for people to stay engaged with the bouts. American non-fencers are not used to seeing fencing every day or on television so they don’t have the prior experience of understanding the actions and movements of the sport. Without an understanding of the rules and play, spectators become disengaged and uninterested. Filming epee in this way will allow any level of spectator to appreciate and see the athletic achievements of these fencers. With the 2012 Olympics approaching, this film will help spread knowledge and fandom for the sport.